So we all know I pretty much only make sweet things. This is one of the few savory items I make regularly and it’s also probably the most caloric thing ever. But it is sooooo good—I promise. It’s the kind of thing you’ll be sneaking into the kitchen for late at night…and early in the morning…and for a snack. In fact, I’d recommend cutting the recipe in half just in case you eat it all in one sitting. Mix hash browns, pepper, salt, sour cream, and cream of chicken in a large bowl. Pour into a greased casserole dish. 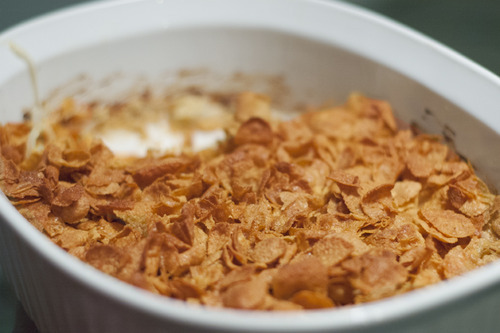 Melt 1 stick of butter and mix with 5 cups of corn flakes. Top the potato mixture with the buttered corn flakes. Bake 1 hour at 350 F.